Indian Cuisine Tutorials: Equipment And Utensils - Tandoor - Simply Fahad-istic! This is Post No. 8 in Indian Cuisine Tutorials series.A new one each day! The name 'Tandoori Chicken' is derived from Tandoor,the cylindrical clay oven,which resembles an oil drum in its appearance. 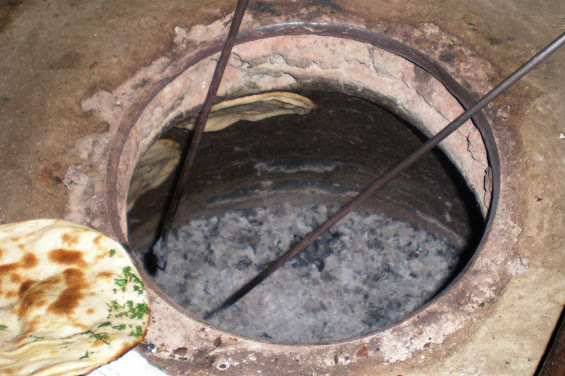 Tandoor is traditionally heated by a live charcoal fire which is burnt inside it.As the charcoal burns,not only does it heat the air inside the tandoor,but also its clay walls.This makes the tandoor suitable for cooking flat breads too,as they can be slammed against the blisteringly hot walls,and then removed when done.Kababs and appetizers like tandoori chicken are threaded onto skewers and placed inside the hot oven.As they cook,the marinade and juices of food drip onto the charcoal,turning into smoke and infusing the preparations with smoky flavor.Modern tandoors use electricity and gas instead of charcoal since a charcoal fire is not only expensive,but also messy.Not just in India,tandoors are used for cooking in other countries like Pakistan,Afghanistan and Iran as well. 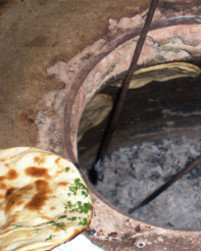 Get Stainless Steel Tandoor Oven 36" x 36" x 36"